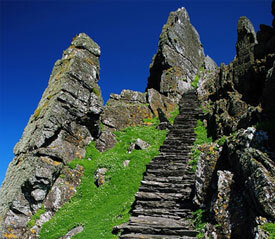 Only one tour to land on Skellig Michael takes place daily. 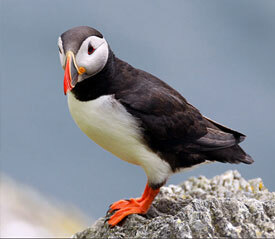 It leaves at 8:45 am each morning from Portmagee harbour - subject to weather conditions. Booking in advance is strongly advised as places for tours to land are limited. The cost of the tour to land is €100 per person for the 2018 season. Unfortunately due to adverse weather and sea conditions tours are often cancelled. Your deposit will be refunded to you. It may not be possible to reschedule you on the follow day’s tour. Given the limited spaces available for the tour to land, multiple bookings over a group of days are not permitted. Receiving contact information (Phone / Email) etc during the booking phase are of paramount importance as this ensures you will be contactable should trip times change / are cancelled. If for any reason departure times are required to change, you will be notified in advance. The skippers decision in relation to weather is final. Failure to make contact via phone call on the morning of your trip to confirm attendance may result in cancellation of your place. Please arrive at Portmagee harbour at 08:30 in the morning. The boat trip to the Skelligs takes 50 minutes. Once landed, the allocated time to explore the island ranges between 2 and 2.5 hours (weather dependent). It is advisable to bring a packed lunch to eat during your time on the island. Footwear with good grip is essential on Skellig Michael. Please be prepared for the day's weather conditions by dressing appropriately. Warn clothing / wet gear are highly recommended. Should the journey out / back be particularly wet, capes are provided on board. The tour will also include a stop at Little Skellig, giving you the opportunity to take in the birdlife and marine life that inhabits it's perches. The return boat trip will also take 50 minutes and you will arrive back to Portmagee harbour at approximately 2:15pm. Sorry but we do not cater for children under 10 years of age. You must contact us 2 days in advance of the sailing date. Contact us again on the morning of the sailing to confirm weather conditions. 14th May to the 2nd October. The boat departs daily from Portmagee harbour at approximately 08:45am, weather permitting. The boat trip to the Skelligs takes 50 minutes and you have between 2 and 2.5 hours on the rock. 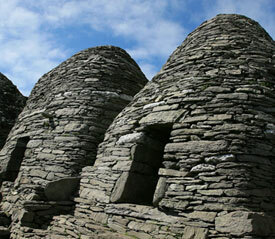 The Skelligs tour stops for a while at the Little Skelligs to allow you to view the bird colony and seals. The return boat trip lasts a further 50 minutes and you are back in Portmagee at approximately 14:15pm. Unfortunately due to adverse weather and sea conditions tours are often cancelled. Pre-paid tours will receive a refund. When you book on as standby with us you are placed on our list. If you have decided to place yourself on the list, it is important that you do check your email regularly. Once we receive a cancellation we will send out a notification via email that there is availability for your particular date. Once the email has been sent to you it will be your responsibility to make contact with us. The best way to try and secure that booking from the standby list once you receive the notification of availability is to contact us by phone. Also if you have placed yourself on the standby list it would be important that you are in the local vicinity. It will increase you chances, but unfortunately will not guarantee you a place. There is a €20 deposit for all Eco Cruises plus a 5% handling fee. The balance is a cash payment made on the boat. Eco Tours depart from Portmagee Marina on a regular basis. These time may change depending on demand. Details of departure times will be displayed on your booking ticket. Please arrive at Portmagee harbour up to 20 minutes prior to the boat departure. The boat trip around the Skelligs is a 2.5 hrs approximately. View of the east landing (also known as the blind cove), which contain ancient steps to the monastery. View of the south landing, which contains a second set of ancient steps to the monastery. View of the north landing, which contains a third set of ancient steps to the monastery. View of Christ’s Saddle, Monastery on cliff side of Skellig Michael. View of roadway build by lighthouse people between 1821-1826 which sits on the cliff face and travels right up to the monastery. View of lower lighthouse (still in operation), and upper lighthouse (now in ruins). View of the wailing woman, the monastic settlement and hermitage cells on the south peak. 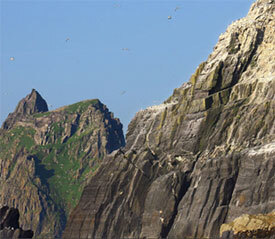 Viewing at Little Skellig includes the vast birdlife (75,000 gannets and growing) and marine life such as the grey seal. We do not have an age restriction on the Eco Tour around the Skelligs, but we will make a safety call on the day of the sailing in relation to the weather. You must contact us one day in advance of the sailing date. We reserve the right to change the departure time and will give advance notice. The boat tour around the Skelligs is 2.5 hrs approximately. 1st April to the 31st October. If you cancel your tour 7 days in advance of the sailing date, no cancellation fee applies and you will receive a full refund on the amount paid. If you cancel you tour less than 7 days in advance, no refund will be issued. No refund will be given for a no-show. If the tour is cancelled due to adverse weather conditions, your deposit will be refunded to you. It is important that you contact us on the morning of the sailing to discuss the weather conditions by phone. Receiving contact information (Phone / Email) etc during the booking phase are of paramount importance as this ensures you will be contactable should trip times change/ cancelled. The decision of the skipper is final in relation to the cancellation of the tour. Sorry but we do not cater for children under 12 years of age.